Sputnik I (Russian) is launched. About the size of a basketball, the first artificial Earth satellite weighs 184 pounds and takes about 98 minutes to complete one orbit. The United States launches its first satellite, the 30.8-pound Explorer 1. U.S. Lunar Orbiter 1 enters moon orbit, and takes the first picture of the Earth from the distance of the moon. Apollo 8 flight to the moon. As the ship travels outward, the crew focuses a portable television camera on Earth and for the first time humanity sees its home from afar, a tiny "blue marble" hanging in the blackness of space. First Manned Moon Landing: Neil Armstrong and Edwin Aldrin, Jr. became the first humans to set foot on another world. 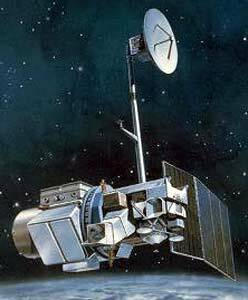 American space probe Mariner 9 is the first spacecraft to orbit another planet, Mars. 100% of the Martian surface is mapped over the next year. First U.S. Space Station: Skylab is launched. NASA launches the first Synchronous Meteorological Satellite, SMS-1. NASA changes ERTS program name to Landsat. Voyager 1 and Voyager 2 are launched to meet with Jupiter in 1979 and Saturn in 1980. First Space Shuttle Columbia is launched. Land Remote Sensing Commercialization Act : Facilitated the commercialization of the Federal Government's civilian land remote-sensing satellite system, known as Landsat. EOSAT takes control of Landsat-4 and Landsat-5. Hubble Space Telescope is launched. While the telescope is successfully deployed, the primary mirror is seriously flawed resulting in fuzzy images. Land Remote Sensing Policy Act: Authorized the procurement of Landsat 7 and assured the continued availability of Landsat digital data and images. X Prize competition announced: 10 Million dollars to the first person or team to safely launch and land a spacecraft capable of carrying three people to a suborbital altitute or 100km and repeat the trip again within two weeks. This contest is designed to inspire and jumpstart civilian and commercial space programs. Space Imaging relinquishes Landsat commercial rights and operational control of Landsats 4 and 5 to USGS. Space Imaging aquired by ORBIMAGE. The combined company was rebranded as GEOEYE, the world's largest commercial remote-sensing company.